Oil is a nonrenewable natural resource that is subject to fluctuations in price because of international politics. That is one of the reasons why it is necessary to use renewable resources that are not subject to instability; solar power is such a resource. Solar energy is essentially unlimited and it does not contribute to global pollution like oil does. It is easier than ever for homeowners to obtain solar panels because solar panels are more affordable than ever because their price keeps falling. Residents of California are particularly well suited for photovoltaic (PV) systems because of the sunny weather and the incentives that encourage their use. So, if you are interested in solar panels in the Woodland Hills area or any location in the Los Angeles area, contact us at Pacific Green Homes to take advantage of our expertise in solar panel installation. Woodland Hills has a subtropical mediterranean climate, which is another way of saying that it gets very hot in the summer and very cold during the winter. These temperature extremes can result in some very high energy bills. Fortunately solar energy can alleviate much of that financial burden. The long hot days of constant sunshine mean that solar panels are highly viable in Woodland Hills. The panels will receive a constant source of energy, so they will be operating at peak efficiency at the time when they are needed the most. The cost of a PV system in Woodland Hills depends on two factors; the number of panels and the power output of those panels. The number of panels is largely dependent on the size of the roof on which they will be installed. The power output can vary from 3 kW (kilowatts) up to 12 kW. The solar arrays with a higher power output are, of course, more expensive but they are not necessary for most homes; they are mainly for houses with smaller roofs, a system that outputs 3kW or 5kW is suitable for most homes. The price per watt of installing a PV system in Woodland Hills is $3.63, so the cost of a 3kW system would be about $10,890, and a 5kW system would be in the $18,150 range. These may seem expensive, but there are a few factors to consider, such as the fact that the system will payback the cost of the investment in five to seven years. There is also the fact that, thanks to various incentive programs, the cost of the system will actually be lower than indicated. The Federal Government offers the Residential Renewable Energy Tax Credit that offers a 30% rebate to anyone who purchases a PV system. This program can save thousands of dollars on the price and installation of a solar array. The LADWP (Los Angeles Department of Water and Power) also offers the SIP (Solar Incentive Program) that offers homeowners a rebate of 25 cents per watt on the purchase of a solar array. Both of those incentive programs contribute to residents saving a lot of money on the price of a solar installation. The most immediate benefit is the energy savings a solar array can provide, it can reduce the utility bill by a remarkable amount, it can even reduce the utility bill to zero. However, that is only if the system generates as much, or more, power than the home uses. That will not be the case for most people, but they will experience reduced energy bills nonetheless. Solar power also strongly benefits the environment because it does not produce any harmful greenhouse gases. It is also a renewable resource that is not subject to market fluctuations or foreign influence. Furthermore, the carbon reduction of a 5kW solar array on just one house is the same as over one hundred trees. 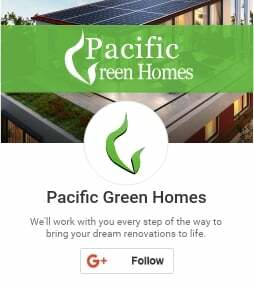 Should you decide that you want to reap the benefits of solar panels for your home, contact Pacific Green Homes for consultation, advice, and installation services, all performed at the highest level. We will help to give you all the advantages provided by going solar.